Ary Scheffer (10 February 1795 – 15 June 1858), was a Dutch - French Romantic painter. 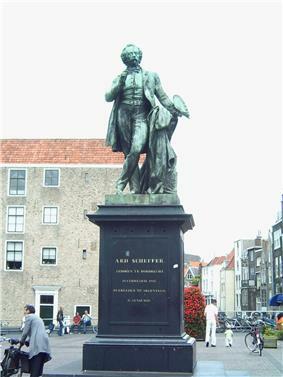 Statue of Ary Scheffer on the Scheffersplein in Dordrecht created by Joseph Mezzara after a design by Scheffer's daughter Cornelia. Scheffer was the son of Johan Bernard Scheffer (1765-1809), a portrait painter born in Hamburg or Kassel who had moved to the Netherlands in his youth, and Cornelia Lamme (1769-1839), a portrait miniature painter and daughter of the Dordrecht landscape painter Arie Lamme, after whom Arij (later Ary) was named. He had two brothers, the journalist and writer Karel Arnold Scheffer (1796-1853) and the painter Hendrik Scheffer (1798-1862). He was taught by his parents and attended the Amsterdam drawing academy from the age of 11. In 1808 his father became court painter of Louis Bonaparte in Amsterdam, but he died a year later. Encouraged by Willem Bilderdijk, he moved to Lille for further study after the death of his father. In 1811 he and his mother, who had a large influence on his career, moved to Paris, where he studied at the École des Beaux-Arts as a pupil of Pierre-Narcisse Guérin. His brothers followed them later. 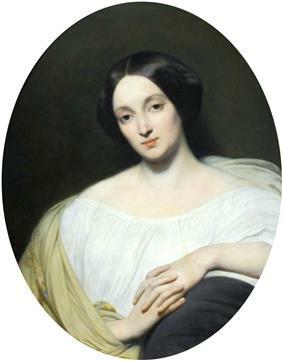 In 1830 Scheffer had a daughter Cornelia. He registered the name of her mother as Maria Johanna de Nes, but nothing is known about her and she may have died soon after Cornelia's birth. Considering that his own grandmother's name was Johanna de Nes, it has been speculated that he kept Cornelia's mother's name a secret not to compromise a noble family's reputation. Cornelia Scheffer (1830-1899) became a sculptor and painter in her own right. Scheffer's mother did not know of her namesake granddaughter until 1837, after which she took care of her until she died only two years later. Scheffer was made commander of the Legion of Honour in 1848. As a captain of the Garde Nationale he escorted the royal family in their escape from the Tuileries and escorted the Duchess d'Orléans to the Chambre des Députés where she in vain proposed her son to be the next monarch of France. Scheffer fought in the army of Cavaignac during the popular uprising in Paris, but he was so shocked by the cruelty and hatred from the government's side and the misery of the lower classes that he withdrew from political activity and refused to make portraits of the family of Napoléon III. On March 16, 1850 he married Sophie Marin, the widow of General Baudrand, and on November 6 of that year he finally became a French citizen. 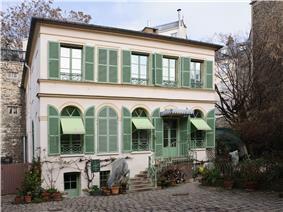 He continued his frequent travels to the Netherlands, and made trips to Belgium, Germany and England, but a heart condition slowed him down and in 1858 took his life in his summerhouse in Argenteuil. He is buried in the Cimetière de Montmartre. Scheffer often painted subjects from literature, especially the works of Byron and Goethe. Two versions of Dante and Beatrice and have been preserved at Wolverhampton Art Gallery, United Kingdom, and Museum of Fine Arts, Boston, USA. Particularly highly praised was his Francesca da Rimini painted in 1836. Ary Sheffer's popular Faust-themed paintings include Margaret at her wheel; Faust doubting; Margaret at the Sabbat; Margaret leaving church; The garden walk, and Margaret at the well. In 1836, he painted two pictures of Goethe's character Mignon. One of the reduced versions of his Christus Consolator(the major work today to be found in the Van Gogh-museum, Amsterdam), lost for 70 years, was rediscovered in a janitor's closet in Gethsemane Lutheran Church in Dassel, Minnesota in 2007. It has been restored and is on display at the Minneapolis Institute of Arts. After 1846, he ceased to exhibit. His strong ties with the royal family caused him to fall out of favour when, in 1848, the Second Republic came into being. 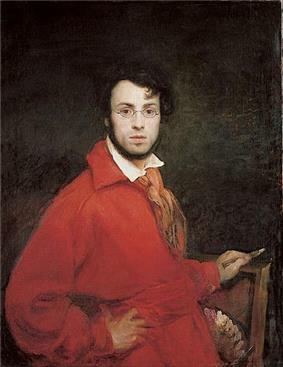 Shut up in his studio, he produced many paintings that were only exhibited after his death in 1858. 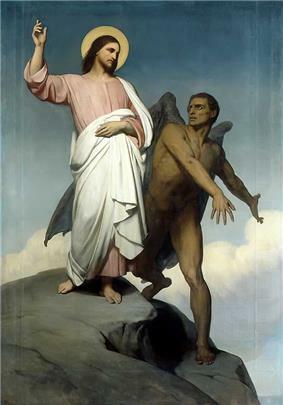 The works first exhibited posthumously include Sorrows of the earth, and the Angel announcing the Resurrection, which he had left unfinished. By the time of his death, his reputation was damaged: though his paintings were praised for their charm and facility, they were condemned for poor use of color and vapid sentiment.